Who is Marion City Band? 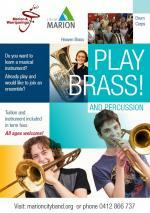 We are a busy and very active community brass band based in the City of Marion, Adelaide, South Australia. 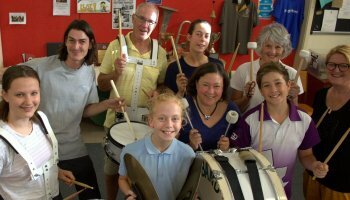 Marion City Band was established in 1969, and is celebratiing 50 years of success, We continue to provide opportunities for musical growth and development to youths and adults alike through four ensembles: Marion City Band, Warriparinga Brass, Warriparinga Youth and Heaven Brass. If you can already play a brass instrument or percussion, or if you would like to learn (we have a great learners program), or would like more information, please Contact Us. Want to know more? Contact us for further information, or drop in at our rehearsal times to meet us. Want Marion City Band to perform at your next function? 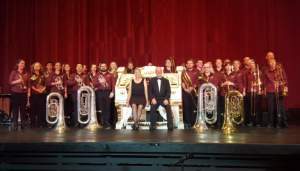 Why not hire Marion City Band to entertain at your next event? From smaller ensembles to a full onstage brass band. We may have just the sound you need! Community entertainment and private functions enquiries welcome. Cabarets, birthdays, christmas parties, awards nights, weddings, engagements, anniversaries, memorial services - please give us a call to discuss a booking.